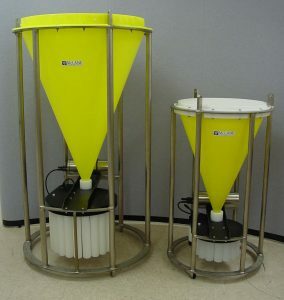 The Parflux time-series sediment trap was the first product developed by Sus Honjo and Ken Docherty when they founded McLane Research Laboratories back in 1983, and remains a major product line today. There are instruments deployed from the Arctic to the Antarctic regions, and some sampling stations have been continuously occupied by a McLane Sediment Trap for over 30 years. McLane Sediment Traps collect settling particles into sample bottles in a time-series programmed by the user. They play an important role in studies of the global carbon cycle. In addition to time-series measurement of particle flux, McLane Parflux sediment traps are ideal for biogeochemical studies, paleoproxy and radionucleide investigations and for environmental and pollution monitoring. The traditional Mk78H Sediment Trap collects 21 or 13 samples in 250 or 500ml bottles. The Mk 8 sediment trap is half the size of the traditional sediment trap and collects 13 samples. The WSD-10 wet sample divider splits a wet particle sample into 5 or 10 equal samples. This is very useful where scientists want to split and share the precious samples obtained from a sediment trap for different types of analysis. Time-series sampling is pre-programmed or triggered adaptively. Mk 78H Sediment Traps have 13 or 21 sample bottles of 250ml or 500ml. Mk 8 Model is half the size of the Mk78H for easier handling and deployment. Corrosion resistant Titanium frame and electronics housing. Sample bottles are tested in 90 degree configuration to ensure sample collection.